From the invention of the decimal system in mathematics to the noble philosophy of ahimsã, Hindus have contributed their share in all fields of knowledge and learning. Over five thousand years ago, when Europeans were only nomadic forest dwellers, ancient Hindus had established a civilization, known as the Harappan culture, in the Indus Valley, the northwestern region of India. When much of the world was still sunk in sleep, people of the Harappan culture were conducting trade workshops in weaving, bead-making, pottery, dying of fabrics, and metallurgy. Although modern images & descriptions of India often show poverty, India was one of the richest countries till the time of British in the early 17th Century. Christopher Columbus was attracted by India's wealth and was looking for route to India when he discovered America by mistake. If readers, who have diligently read their schoolbooks on India, are surprised that they haven't been told of these ideas before, the fault is of the books they have used. Such books are as worthless as would be books on America, two hundred years from now, that describe only matters of conflict between race, language, and gender, ignoring completely the achievements of science, art, and imagination. The official Sanskrit name for India is Bharat. INDIA has been called Bharat even in Satya yuga. Did you know that by 7500 B.C. Bharat (India) already had advanced townships with villages of mud-brick houses? Bharatvarsh (the Indian Subcontinent) is home to the oldest civilization in the world. Mehrgarh which dates to 7500 BC is the oldest city which predates the Indus Valley Civilisation. Recently there have been archaeological findings off the coast of Gujarat in India which confirm a submerged city which is the worlds oldest city. This Indian city dates back to 8000-9000BC. A scientifically planned towns and buildings were part of the landscape and about 300 settlements in a belt extending 1,520 km from North to South covering a million square kilometers have been discovered, of which Harappa, Mohenjo-Daro, Kalibangan, and Lothal are important sites. The towns were designed with citadels and defensive walls and the streets and lanes had drains. Individual bathrooms and lavatories were impressively drained into a larger system. Well-developed docks and store houses as well as bullock carts for transportation were very popular. The earliest recorded Indian mathematics was found along the banks of the Indus. Archaeologists have uncovered several scales, instruments, and other measuring devices. The Harappans employed a variety of plumb bobs that reveal a system of weights 27.584 grams. If we assign that a value of 1, other weights scale in at .05, .1, .2, .5, 2, 5, 10, 20, 50, 100, 200 and 500. These weights have been found in sites that span a five-thousand-year period, with little change in size. Archaeologists also found a “ruler” made of shell lines drawn 6.7 millimeters apart with a high degree of accuracy. Two of the lines are distinguished by circles and are separated by 33.5 millimeters, or 1.32 inches. This distance is the so-called Indus inch. 'In subsequent years, further excavations along the 1800 miles of the Indus river valley revealed more than 150 sites, half a dozen of the cities. The whole area, from the Arabian sea to the foothills of the Himalayas, was once the home of a great civilization that rivaled Egypt or Greece. To the east of the Indus lies a vast desert, the Thar Desert. When remains of towns were found in this desert there was some puzzlement about how they had survived in such arid conditions. Then satellite photography revealed the answer: the Thar Desert was once a fertile plain, traversed by a great river; there were even unmistakable signs of canals. Now only a small part of this river, the Ghaggar, exists. Scholars concluded that the river that had now vanished was the Sarasvati, mentioned in the Vedic hymns. It seemed that in the heyday of Mohenjo-Daro and Harappa, this whole plain was one of the richest places in the world. At a time when ancient Britons were Bronze Age farmers, and the Greeks were a few Mycenaean warrior tribes, one of the world's greatest civilizations flourished in the land of the Indus and the Sarasvati. Did you know that the oldest book in the library of humans is the Rigveda? The existence of the Vedas go beyond recorded history and are said to be passed down from the Gods to the great seers of Bharat. For many human generations the Vedas were passed on through word of mouth, until finally documented by the great Rishis and Swamis. 'The Vedas are written in Sanskrit, a complex language that Sir William Jones - in 1786 - demonstrated to be related to Greek, Latin, German and Celtic (giving rise to the expression 'Indo-European languages'). And if the Vedas speak of the Sarasvati River, then it would seem clear that they were written before about 2000 BC, and not later than 1500 BC, as scholars originally believed. And if - as seems likely - Sanskrit was the language of the Aryans, then it was also clear that they could not have invaded as late as 1500 BC. There are four major collections of Vedic hymns - the Rig-Veda, the Samaveda, the Yajurveda and the Atharvaveda, of which the Rigveda is recognized as the oldest and most important. In the 1980's, a Vedic scholar, David Frawley, observed that the hymns of the Rigveda are full of an oceanic symbolism that seems to argue that they sprang from the maritime culture - which certainly contradicted the assumption that the Aryans came from somewhere in central Europe. He also noted hymns that spoke of the 'ancestors' as coming from across the sea, having been saved from the great flood. Studying the astronomical references in the Vedic hymns, Frawley concluded that one reference to a summer solstice in Virgo indicated a date of about 4000 BC, while a reference to a summer solstice in Libra pointed to about 6000 BC. He also concluded that the authors of the Vedas were familiar with the precession of the equinoxes. These revolutionary ideas were set out in a book called Gods, Sages and Kings (1991). Did you know that the Ramayana is the first poetry of the world? It is a glorious Samskrit epic written by the Divine Sage Valmiki. The Ramayana begins with the author, Sage Valmiki, asking Narada: "O Venerable Rishi, please tell me, is there a perfect man in this world who is virtuous, brave, dutiful, truthful, noble, kind to all beings, and adored by all?" Narada replies: "Rama." The Ramayana has 24,000 Samkskrit verses. It later translated by Kamban and Tulsi Das. Did you know that the Mahabarata is the longest poetry ever written? Its 100,000 verses encompass all facets of Dharma or human way of life. It narrates the story about the great Mahabarata war between the noble Pandavas and their evil cousins the Kauravas. The Ashtadhyayi is a grammar of the Sanskrit language by Dakshiputra Panini (450 BC) that describes the entire language in 4,000 algebraic rules. The structure of this grammar contains a meta-language, meta-rules, and other technical devices that make this system effectively equivalent to the most powerful computing machine. No grammar of similar power has yet been constructed for any other language since. The famous American scholar Leonard Bloomfield called Panini's achievement as "one of the greatest monuments of human intelligence." The other side to the discovery of this grammar is the idea that language (as a formal system) cannot describe reality completely. This limitation of language, the rishis tell us, is why the Truth can only be experienced and never described fully! Did you know that as early as 700 B.C., there existed a giant University at Takshashila, located in the northwest region of Bharat (India)? Taxila also known as Takshashila, flourished from 600 BC to 500 AD, in the kingdom of Gandhar. 68 subjects were taught at this university and the minimum entry age, ancient texts show, was 16. At one stage, it had 10,500 students including those from Babylon, Greece, Syria, and China. Experienced masters taught the vedas, languages, grammar, philosophy, medicine, surgery, archery, politics, warfare, astronomy, accounts, commerce, documentation, music, dance and other performing arts, futurology, the occult and mystical sciences,complex mathematical calculations. The panel of masters at the university included legendary scholars like Kautilya, Panini, Jivak and Vishnu Sharma. Thus, the concept of a full-fledged university was developed in India. Did you know that the University at Nalanda functioned from 500 to 1300 AD until destroyed by invaders? During the 800 years that the university was operational, it attained great fame. Its campus was one mile in length and a half-mile in width. It also had 300 lecture halls with stone benches for sitting; laboratories and other facilities were also available. For example, the university had a towering observatory called the Ambudharaavlehi for astronomical research. It has boasted a massive library called Dharma Gunj or Mountain of Knowledge that was set up in three buildings named Ratna Sagar, Ratnodavi and Ratnayanjak. The entrance examination was very difficult and the pass rate was 3 out of every 10 students. Despite this hurdle, the Chinese traveler, Hien Tsang wrote in his diary that 10,000 students and 200 professors were at Nalanda University. Do you know that India is the birthplace of many great intellectual inventions including the number system, algebra, trigonometry, calculus? The so called Arabic numerals are actually Hindu numerals and even many Arab mathematicians admit that. During the 700's, the Arabs learned Hindu arithmetic from scientific writings of the Hindus and the Greeks. Then, in the 800's, a Persian mathematician wrote a book that was translated into Latin about 300 years later. This translation brought the Hindu-Arabic numerals into Europe. Did you know that Hindus gave us the method of expressing numbers by means of a decimal system? Hindu mathematicians used a system based on 10. The Hindus had symbols for each number from one to nine. They had a name for each power of 10, and used these names when writing numerals. For example, Hindus wrote "1 sata, 3 dasan, 5" to represent the number we write as 135. They wrote "1 sata, 5" for the number we write as 105. Hindus found a way of eliminating place names. They invented the symbol shunya (meaning empty), which we call zero. With this symbol, they could write "105" instead of "1 sata, 5." The largest numbers the Greeks and the Romans used were 106 whereas Hindus used numbers as big as 1053 (i.e 10 to the power of 53) with specific names (Tallakshana) as early as 5000 B.C. during the Vedic period. Even today, the largest used number is Tera: 1012 (10 to the power of 12). The place value system is built into the Sanskrit language and so whereas in English we only use thousand, million, billion etc, in Sanskrit there are specific nomenclature for the powers of 10, most used in modern times are dasa (10), sata (100), sahasra (1,000=1K), ayuta (10K), laksha (100K), niyuta (106=1M), koti (10M), vyarbuda (100M), paraardha (1012) etc. Results of such a practice were two-folds. Firstly, the removal of special importance of numbers. Instead of naming numbers in grops of three, four or eight orders of units one could use the necessary name for the power of 10. Secondly, the notion of the term "of the order of". To express the order of a particular number, one simply needs to use the nearest two powers of 10 to express its enormity. a group of numbers which are increasing integral powers of 10, starting with 102 (satam sagasara, ayut, niyuta, prayuta, arbuda, nyarbuda, samudra, Madhya, anta, parardha…). To understand why word numerals persisted in India, even after the Indian numerals became widespread, it is necessary to recognize the importance of the oral mode of preserving and disseminating knowledge. An important characteristic of written texts in India from times immemorial was the sutra style of writing, which presented information in a cryptic form, leaving out details and rationale to be filled in by teachers and commentators. In short pithy sentences, often expressed in verse, the sutras enabled the reader to memorize the content easily. Did you know that the ancient Hindus originated the concept 'zero'? The concept of zero is referred to as shunya in the early Sanskrit texts and it is also explained in the Pingala’s Chandah Sutra (200 AD). In the Brahma Phuta Siddhanta of [[[Brahmagupta]] (400-500 AD), the zero is lucidly explained. The Hindu genius Bhaskaracharya proved that x divided by 0 = 4 (infinity) and that infinity however divided remains infinity. This concept was recognized in Hindu theology millennia earlier. The earliest recorded date for an inscription of zero (inscribed on a copper plate) was found in Gujarat (585 – 586 AD). Later, zero appeared in Arabic books in 770 AD and from there it was carried to Europe in 800 AD. The Indian place-value numeration with zero sign ranks among humanity's fundamental discoveries. A binary number system was used by Pingala (450 BC, if we accept the tradition that he was Panini's brother) to represent meters of songs. The structure of this number system may have helped in the invention of the sign for zero that, took place around 50 BC - 50 AD. Without the binary system, the development of computers would be much harder; and without a sign for zero, mathematics would have languished. It is of course true that the binary number system was independently invented by Leibnitz in 1678, but the fact that the rediscovery had to wait almost 2,000 years only emphasizes the originality of Pingala's idea. Can you imagine today’s computers without the invention of zero? Did you know that Geometry, Algebra, Trigonometry and Calculus are studies which originated in India? The word geometry emerged from the Sanskrit word gyaamiti which means measuring the earth. The word trigonometry emerged from the Sanskrit word trikonamiti meaning measuring triangular forms. Did you know that all Hindu fire altars are complex forms of Geometrical forms? The concept of geometry emerged around 1000 BC in India from the practice of making fire altars in geometric shapes. The treatise of Surya Siddhanta (4th century AD) describe in amazing detail the science of trigonometry. Trigonometry was introduced in Europe 1200 years later in the 16th century. All Buddhist as well as Hindu Mandalas and Yantras are complex forms of Geometrical shapes. From India the sine function was introduced to the Arab world in the 8th century, where the term jya was transliterated into jiba or jyb. Early Latin translations of Arabic mathematical treatises mistook jiba for the Arabic word jaib, which can mean the opening of a woman's garment at the neck. Accordingly, jaib was translated into the Latin sinus, which can mean "fold" (in a garment), "bosom," "bay," or even "curve." Hence our word "sine." The word “Algorithm” was actually supposed to be pronounced “Al-Khwarizmi”, which was the name of an eminent 9th century Arab scholar, who played important roles in importing knowledge on arithematic and algebra from India to the Arabs. In his work, De numero indorum (Concerning the Hindu Art of Reckoning), it was based presumably on an Arabic translation of Brahmagupta where he gave a full account of the Hindu numerals which was the first to expound the system with its digits 0,1,2,3,…,9 and decimal place value which was a fairly recent arrival from India. The new notation came to be known as that of al-Khwarizmi, or more carelessly, algorismi; ultimately the scheme of numeration making use of the Hindu numerals came to be called simply algorism or algorithm. Did you know that the ratio of the circumference and the diameter of a circle known as Pi (a value of 3.141592657932…) was first calculated by Hindus? The Sanskrit text, by the famous Hindu mathematician, Baudhayana in his Baudhayana Sulbha Sutra of the 6th century BC mentions this ratio as approximately equal to 3. The Hindu mathematician, Aryabhatta, in 499 AD worked out the value of Pi to the fourth decimal place as [3x (177/1250) = 3.1416]. In 825 AD one Arab mathematician Mohammad Ibna Musa said: This value has been given by the Hindus [Indians] (62832/20,000 = 3.1416). A Mathematician named Pingala (c. 100BC) developed a system of binary enumeration convertible to decimal numerals. He described the system in his book called Chandahshaastra. The system he described is quite similar to that of Leibnitz, who was born in the 17th century. Did you know that the so-called Pythagoras Theorem that the square of the hypotenuse of a right-angled triangle equals to the sum of the square of the other two sides was documented by the famed Hindu mathematician Baudhayana in his 6th century BC treatise called Baudhayana Sulba Sutra? Baudhayana states: "The area produced by the diagonal of a rectangle is equal to the sum of area produced by it on two sides." Did you know that the famous Hindu astronomer, Bhaskaracharya in his Surya Siddhanta wrote: "Objects fall on the earth due to a force of attraction by the earth. Therefore, the earth, planets, constellations, moon and sun are held in orbit due to this attraction." It was not until 1687, 1200 years later did Issac Newton "rediscover" the Law of Gravity. In Surya Siddhanta, dated 400-500 AD, the ancient Hindu astronomer Bhaskaracharya states, "Objects fall on the earth due to a force of attraction by the earth. Therefore, the earth, planets, constellations, moon, and sun are held in orbit due to this force." Approximately 1200 years later (1687 AD), Sir Isaac Newton rediscovered this phenomenon and called it the Law of Gravity. Do you know Indian astronomers had mapped the sky 4000 years ago? One thousand years before Copernicus (1543) published his theory of the revolution of the earth, the famous Hindu mathematician, Aryabhatta in the 5th century (400-500 AD) clearly stated this fact: "Just as persons traveling on a boat feel that the trees on a bank are moving, people on earth feel that the sun is moving." In Aryabhatta’s treatise (Aryabhateean) on this subject matter he clearly states that the earth is round; it rotates on its axis, orbits the sun and is suspended in space. Aryabhatta, in his treatise also explained that lunar and solar eclipses occur by the interplay of the shadows of the sun, the moon and the earth. India's first man made satellite was named Aryabhatta. Copernicus published his theory of the revolution of the earth in 1543. Bhaskaracharya rightly calculated the time taken by the earth to orbit the sun hundreds of years before the astronomer Smart. His calculations was - Time taken by earth to orbit the sun: ( 5th century ) 365.258756484 days. Today’s accepted measurement is 365.2564 days. Therefore, assuming that today’s figures are correct, it means that Bhaskaracharya was off by only 0.0002%. India gave the largest measurement of time as 8.64 billion years. The Gregorian calendar on your desk simply adds on one day for every 4 years and is not in coherence with the movement of sun. But, Hindu calendar is in coherence as the short fall is corrected in the month itself by adding Adhikamasa as postulated by Maharshi Vishwamitra. Rig Veda 1.164.1, 2, 14 and 15 describe sun's motion, ritus and colours of spectrum. Kalyana varma, Varahamihira, Jaimini, Vidyanatha Deekshita, Kalidasa, Mantreshwara, Satyacharya, Venkatadri, Parashara, Ramadayalu and Garga have immensely contributed for the development of Hindu astrology. The idea that the universe is very old is quite startling, when one notes that humanity's collective memory doesn't go further than a few thousand years. The Puranas speak of the universe going through cycles of creation and destruction of 8.64 billion years, although there are longer cycles as well. The figure of 8.64 billion years is about right based on current astrophysical estimates. The revolutionary nature of this idea becomes clear when one notes that only a couple of hundred years ago the dogma in most Eurasia was that the world was created in 4004 BC. Do you know that the Hindus view that the Universe has no beginning or end, but follows a cosmic creation and dissolution? Hindus are the only one who propounds the idea of life-cycles of the universe. It suggests that the universe undergoes an infinite number of deaths and rebirths. Hindus views the universe as without a beginning (anadi = beginning-less) or an end (ananta = end-less). Rather the universe is projected in cycles. Hindu scriptures refer to time scales that vary from ordinary earth day and night to the day and night of the Brahma that are a few billion earth years long. According to Carl Sagan, "A millennium before Europeans were wiling to divest themselves of the Biblical idea that the world was a few thousand years old, the Mayans were thinking of millions and the Hindus billions". Continues Carl Sagan, "… is the only religion in which the time scales correspond… to those of modern scientific cosmology." Its cycles run from our ordinary day and night to a day and night of the Brahma, 8.64 billion years long, longer than the age of the Earth or the Sun and about half the time since the Big Bang". One day of Brahma is worth a thousand of the ages (yuga) known to humankind; as is each night." Thus each kalpa is worth one day in the life of Brahma, the God of creation. In other words, the four ages of the mahayuga must be repeated a thousand times to make a "day ot Brahma", a unit of time that is the equivalent of 4.32 billion human years, doubling which one gets 8.64 billion years for a Brahma day and night. This was later theorized (possibly independently) by Aryabhata in the 6th century. The cyclic nature of this analysis suggests a universe that is expanding to be followed by contraction… a cosmos without end. This, according to modern physicists is not an impossibility. According to the atomic doctrine of Kanada, there are nine classes of substances: ether, space, and time that are continuous; four elementary substances (or particles) called earth, air, water, and fire that are atomic; and two kinds of mind, one omnipresent and another which is the individual. This system also postulates a subject/object dichotomy, which is a part of the systems of Sankhya and Vedanta as well. In these systems, the conscious subject is separate from the material reality but he is, nevertheless, able to direct its evolution. The atomic doctrine of Kanada is much more interesting than that of Democritus. It is the recognition of the subject/object dichotomy that led to the creation of modern physics. That space and time need not flow at the same rate for different observers is a pretty revolutionary notion. We encounter it in Puranic stories and in the Yoga Vasishtha. Obviously, we are not speaking here of the mathematical theory of relativity related to an upper limit to the speed of light, yet the consideration of time acting different to different observers is quite remarkable. To see the significance of this idea a couple of thousand years ago, note that modern relativity theory was forced upon scientists a hundred years ago by certain equations related to the transmission of electromagnetic waves. Taking his own daughter, Revati, Kakudmi went to Lord Brahma in Brahmaloka, and inquired about a husband for her. When Kakudmi arrived there, Lord Brahma was engaged in hearing musical performances by the Gandharvas and had not a moment to talk with him. Therefore Kakudmi waited, and at the end of the performance he saluted Lord Brahma and made his desire known. After hearing his words, Lord Brahma laughed loudly and said to Kakudmi, "O King, all those whom you may have decided within the core of your heart to accept as your son-in-law have passed away in the course of time. Twenty-seven chaturyugas have already passed. Those upon whom you may have decided are now gone, and so are their sons, grandsons and other descendants. You cannot even hear about their names." There are other stories, less dramatic, where an observer returns from a journey to another loka, and finds that people he loves have aged many more decades than he has. Do you know the art of Navigation & Navigating was born in the river Sindh 6000 over years ago? The very word 'navigation' is derived from the Sanskrit word navgatih. The word 'navy' is also derived from the Sanskrit word 'nou'. Did you know that the Atharva Veda contains sections devoted to the science of medicine? The Atharva Veda gave birth to Ayur Veda, the traditional system of Hindu medicine and it was developed around 5000 years ago. This system of medicine is still widely used today in India under the term Ayur Vedic Medicine. The Greek physician Hippocrates (460-377 BCE) is honored as the father of medicine. However, well before Hippocrates, Maharshi Charaka had already written the Charaka Samhitã ("Handbook of a Physician") in 500 BCE. Did you know that a Hindu was the world’s first physician? The west is fond of proclaiming Hippocrates (460 – 377 BC) as the father of medicine, but way before him in 500 BC Maharishi Charaka wrote the famous Charaka Samhita or Physicians’ Handbook. The Charaka Samhita went into great detail to describe human anatomy, pathology, diagnostic procedures, and treatment for various diseases. Charaka defined eight major medical disciplines of Ayur Veda: Shailya Chikitsa (surgery), Shaalakya Chikitsa (head, eye, nose, throat), Kaaya Chikitsa (mental health), Kaumarbhrutya Chikitsa (pediatrics), Agada Tantra (toxicology), Rasaayana Tantra (Pharmacology), Vaajeekarna Tantra (reproductive medicine). Charaka also described the functions of the heart and the circulatory system in great detail. The Charaka Samhita was widely translated in various languages and Charaka was a respected medical authority in both the Arab and Roman empires. Do you know that Sushruta is regarded as the father of surgery and the earliest known work relating to human surgery is Shushruta Samhitã? Sushruta as early as 600 BC used cheek skin to perform plastic surgery to restore and reshape human nose, ears, and lips with incredible results. In his treatise, Shushruta Samhita, he classified surgery into eight types: aaharya (extracting solid bodies), bhedya (excision), eshya (probing), lekhya (sarification), vedhya (puncturing), visravya (extracting fluids), and sivya (suturing). Sushruta worked with 125 kinds of surgical instruments including scalpels, lancets, needles, catheters, etc. Sushruta even devised non-invasive surgical treatments with the aid of light rays and heat. He conducted 300 types of operations such as extracting solid bodies, excision, incision, probing, puncturing, evacuating fluids and suturing. Ancient Indians were also the first to perform amputations, caesarean and cranall surgeries. Over 2600 years ago Sushrata & his team conducted complicated surgeries like cataract, artificial limbs, cesareans, fractures, urinary stones and also plastic surgery and brain surgeries. Chanakya's Arthashãstra describes post-mortems, and Bhoja Prabandha describes brain surgery, successfully performed in 927 AD by two surgeons on King Bhoja to remove a growth from his brain. Usage of anesthesia was well known in ancient India medicine. Detailed knowledge of anatomy, embryology, digestion, metabolism, physiology, etiology, genetics and immunity is also found in many ancient Indian texts. The father of medicine, Charaka, consolidated Ayurveda 2500 years ago. The science of yoga originated from the Vedas. Today many variations of Hatha Yoga, in the form of a system of exercises, are used in many countries for the preservation and growth of the human body. The earliest dam for irrigation was built in Saurashta. According to the Saka King Rudradaman I, a beautiful lake called Sudarshana was constructed on the hills of Raivataka in Chandragupta Maurya's time. Do you know that games like Chess, Snakes and Ladders, Playing Cards, Polo, the martial arts of Judo and Karate had originated in India and it was from here that these games were transmitted to foreign countries, where they were further developed? In the area of recreation and sports India had evolved a number of games. One would be surprised to know today that games like, Chess, Snakes and Ladders, Playing Cards, Polo, the martial arts of Judo and Karate had originated in India and it was from here that these games were transmitted to foreign countries, where they were further developed. Do you know that Kalari is considered to be the most complete and scientific martial art and is the mother of all martial arts? Bodhidharma, a Buddhist monk from India, introduced Kalari into China and Japan in the 5th century. He taught this art in a temple This temple is today known as the Shaolin temple. The Chinese called him Po-ti-tama. What he taught has evolved into Karate and Kung Fu. One can find a lot of similarities among the three. Thus Judo, Karate, Kung Fu and other similar marshal arts which are today identified with the far-east actually originated from India. At times the changes made in the original nature of the Indian sport-forms were so many and so fundamental that the game lost all similarity with its original form in India. Some Indian games were not transmitted abroad and remained confined to India. For instance we have Kabbadi, Kho-Kho, AtyaPatya, Malkhamb, Gulli-danda, etc., which are being played today exclusively in India. In this chapter we shall look into how the games like Chess and Ludo (Snakes and Ladders), the martial art of Karate, and Playing cards had existed in India for the past 2000 years and how in some cases the indigenous form of the game became totally extinct erasing the fact that the game had ever been played in India. The teacher here is not looked upon only as a coach as in western martial arts like boxing and fencing. This relationship between a teacher and student in Judo and Karate could have its roots in the Guru-Shishya tradition of India. The game of chess was invented in India and was originally called Ashtapada (sixty-four squares). "Ashtapada" Sanskrit for spider -"a legendary being with eight legs" was played with dice on an 8x8 checkered board. There were no light and dark squares like we see in today's chess board for 1,000 years. Later this game came to be known as chaturanga. The Sanskrit name Chaturanga means 'quadripartite' — the four angas (divided into four parts). The earliest known form of chess is two-handed chaturanga, Sanskrit for "the 4 branches of the army." 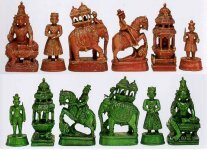 Like real Indian armies at that time, the pieces were called elephants, chariots, horses and foot soldiers. Unlike modern chess, chaturanga was mainly a game of chance; results depended on how well you rolled the dice. In 600 AD this game was learned by Persians who named it Shatranj (derived from the original word Chaturanga). Chaturanga is well recognized as the earliest form of chess. Played on an authentic cloth game surface by 2, 3 or 4 players, Chaturanga combines the basic strategy of chess with the dynamic challenge of chance as each move is determined by the random roll of wooden dice. There is evidence of ‘chaturanga’ having been played with dice, which is still not uncommon, although it involved more skill than chance in this version. In fact, Yudhishthira and Duryodhana, in the Mahabharata, played a version of chaturanga using a dice. Tamilian variations of chaturanga are ‘puliattam’ (goat and tiger game), where careful moves on a triangle decide whether the tiger captures the goats or the goats escape; the ‘nakshatraattam’ or star game where each player cuts out the other; and ‘dayakattam’ with four, eight or ten squares, a kind of ludo. Variations of the ‘dayakattam’ include ‘dayakaram’, the North Indian ‘pachisi’ and ‘champar’. There are many more local variations. The popular game of cards originated in ancient India and was known as Krida-patram. It was one of the favorite pastimes of Indians in ancient times. This game was patronized especially by the royalty and nobility. In medieval India, playing cards was known as Ganjifa cards which were played in practically all royal courts. This game is recorded to have been played in Rajputana, Kashyapa Meru (Kashmir), Utkala (Orissa) the Deccan and even in Nepal. The Mughals also patronized this game, but the Mughal card-sets differed from those of the ancient Indian royal courts. The game of snakes & ladders was created by the 13th century poet saint Gyandev. It was originally called 'Mokshapat.' The ladders in the game represented virtues and the snakes indicated vices. The game was played with cowrie shells and dices. Later through time, the game underwent several modifications but the meaning is the same i.e good deeds take us to heaven and evil to a cycle of re-births. Also known as ‘paramapadam’, there are a hundred squares on a board; the ladders take you up, the snakes bring you down. The difference here is that the squares are illustrated. The top of the ladder depicts a god, or one of the various heavens (kailasa, vaikuntha, brahmaloka) and so on, while the bottom describes a good quality. Conversely, each snake’s head is a negative quality or an asura (demon). As the game progresses, the various karma and samskara, good deeds and bad, take you up and down the board. Interspersed are plants, people and animals. The game serves a dual purpose: entertainment, as well as dos and don’ts, divine reward and punishment, ethical values and morality. The final goal leads to Vaikuntha or heaven, depicted by Vishnu surrounded by his devotees, or Kailasa with Shiva, Parvati, Ganesha and Skanda, and their devotees. In this age of moral and ethical degeneration, this would be a good way of teaching values to children who think they already know more than their parents. If paramapadam teaches moral values, pallankuli develops skill and quick thinking. Two players compete on a board consisting of between seven and twenty pits per player; each player has to collect the coins or shells or seeds with which the game is played, the player with the maximum number being the winner. There are nine variations of this game, each a ‘pandi’, with regional, caste and religious variations. It was very popular among women and required a good memory and alertness, as they had to count and remember the number of coins or seeds accumulated by the opponent. Did you know that the Hindu musical system of ragas codified in the Sama Veda is the oldest living music in the world? The slokas (hymns) of the Vedas are codified in meters and are recited with rich lyricism. Originating from the Sama Veda the different forms of Hindustani and Carnatic music are still immensely popular today. In India, dance has been used both as a vehicle of worship and as an expression of profound emotions, a human being’s most subtle states of mind. The Indian dance system is the oldest and most comprehensive in the world. The world’s earliest evidence of dance is a bronze figurine of a dancing girl discovered in the 4,000-year-old ruin of Mohenjodaro. Bharatanatyam is amongst the oldest of the classical dance forms of India, with a history that goes back more than two thousand years. Integrating elements of music, theater, poetry, sculpture, and literature, this multi-dimensional art has come down through the centuries, as part of a dynamic, vital, living tradition, that offers infinite scope for understanding and exploring the body, mind and spirit. Do you know the original name of Hinduism is Sanatan Dharm which is oldest living spiritual tradition? ‘Sanatan’ means eternal and ‘Dharm’ means those actions, thoughts and practices that promote physical and mental happiness in the world and ensure God Realization. Indian spirituality is not founded by a single person's teachings nor by someone's certain sacrifice but it encourages quest for knowledge. It does not implore to believe in the name of faith. The aim of human life is to attain God realization. Atman (the Self within) gets liberated from samsara (the cycle of birth and death) only after Eighty-four Lakh Janma (8.4 million) manifestations if it do not seek liberation by its own. The human form of life is the only chance for the atman (a soul) to attain God realization, if one understands the disappointing nature of the illusive attractions and attachments of the world and sincerely proceeds on the path of God realization by completely trusting in the causeless kindness of God. Maya is a lifeless power of God having three qualities: sattvic (pious), rajas (selfish) and tamas (impious) that represent its existence when it is evolved into the form of the universe. The universe has two dimensions - material and celestial. The Divine dimension of God lies beyond the field of maya. Do you know that the Hindu scriptures records that there are Eighty-four Lakh Species? There are Eighty-four Lakh Species: (8.4 million species): 0.9 million in Water, 2.7 million nonmoving, 1 Million worms, 1 million Birds, 2.3 million Animals, 4 million Human species including ape and monkeys. Do you know why the number of beads on a set of Hindu mantra counting beads (mala) is 108? The distance from the earth to the moon is 108 times the diameter of the moon. The distance from the earth to the sun is 108 times the diameter of the sun. The sun is 108 times larger than the earth. Yoga psychology, described in the Vedic books and systematized by Patanjali in his Yoga-sutras is a very sophisticated description of the nature of the human mind and its capacity. It makes a distinction between memory, states of awareness, and the fundamental entity of consciousness. It puts the analytical searchlight on mind processes, and it does so with such clarity and originality that it continues to influence people all over the world. Several kinds of yoga are described. They provide a means of mastering the body-mind connection. Indian music and dance also has an underlying yogic basis. The name India, is derived from the River Indus, the valleys around which were the home of the early settlers. The Persians referred to the river Indus as the Sindhu, converted it into Hindu. India is the Largest democracy in the world, the 6th largest country in the world AND one of the most ancient and living civilizations (at least 10,000 years old). We owe a lot to the Indians, who taught us how to count, without which no worthwhile scientific discovery could have been made. — Albert Einstein. India is the cradle of the human race, the birthplace of human speech, the mother of history, the grandmother of legend and the great grand mother of tradition. — Mark Twain. If there is one place on the face of earth where all dreams of living men have found a home from the very earliest days when man began the dream of existence, it is India. — French scholar Romain Rolland. 1. Colin Wilson, From Atlantis to the Sphinx. Virgin Books, London. 1997.